On Friday, Heritage Day here in South Africa, i tried a recipe from a recipe book that my aunt brought for me from her recent travels in Germany (Sommertorten, Dr. Oetker, Wilhelm Heyne Verlag, 2009). Any one or more of Dr Oetker's recipe books are a staple in any respectable German home. My sister and i grew up baking from my grandmother's Dr Oetker's koch bücher! How perfect that on Heritage Day, i happened to make something from one of the recipe books that are so very much a part of my personal heritage! This is a lovely light, fresh, fruity dessert. Ideal for a gorgeous Spring day! Why Japan? Well, to me, blossoms are ultimately Japanese, or rather, when i think of Japan, i immediately conjure up expansive orchards of fruit trees in full blossom! French Women For All Seasons, Mireille Guiliano, Chatto & Windus, 2006. Next to all things foodie, another great love in my life is books. In the beginning of this year, i started a book club... Yes, for the opportunity to, affordably, expand the selection of books i read, but more so, to facilitate a monthly event where food, wine and feminine conversation are top priority. Anyone who is in a book club will know the benefits of this girlie time! One of the books that i selected to read over the month of August was the 2nd book written by Mireille Guiliano. Have you heard of "French Women Don't Get Fat"? Same author. When i selected the book i had no idea that she had written the afore-mentioned book. I also thought the book was going to be an entertaining selection of short-stories from the lives of French Women. I was wrong, and at first, a tad disappointed actually. In general, i am not a fan of life-style books, especially ones that tell me what i should and shouldn't eat. So, at the start, i was a bit apprehensive of finishing it, but a couple of pages into the 2nd chapter, i was hooked. It is a lifestyle book, but it is hardly restrictive and following her guidelines sounds like a whole lot of foodie fun! I LOVE Spring! I've always loved Spring, but this year somehow i have had more time to appreciate the season and all the beauty it has to offer. It seems to me as if there is no end to the array of beautiful blossoms and flowers all around me. To celebrate nature's daily gift to us, i thought it only fitting to make a few Spring beauties of my own. In July of last year, i travelled to France with three of my school friends. We spent four days in the gorgeous capital. On one of our many walks around the beautiful city, we came across a patisserie with a display of the most gorgeous macaroons. 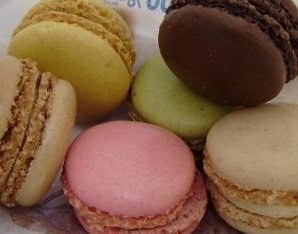 Of course, despite the cost, i bought two of each flavour: vanilla, coffee, pistachio, strawberry, lemon and chocolate. I savoured each of these little delights for as long as i possibly could. Ever since it has been my wish to be able to make macaroons as tasty and gorgeous as those i bought in Paris. I have tried several recipes, several amendments to recipes and searched the intraweb for hints in my endeavour to make the perfect macaroon. EVENTUALLY, i succeeded. With my background in the sciences, i developed a fondness for recording my doings, the outcomes of 'experiments', the differences certain changes brought about, etc. It was, therefore, only natural for me to record all of my 'experiments' in my kitchen! So, many years ago, i started a recipe diary. Something to keep track of recipes that i have tried, changes i make to recipes, their outcomes etc. I have long been wanting to blog these experiments so that i can share my triumphs and failures with others in the hope of making their kitchen endeavours a little easier. Images and content copyright Le Petit Four. Awesome Inc. theme. Powered by Blogger.